The deck was designed to fully make use of Dirty Wererat and Tolarian Winds. As per the instructions, I will play five matches then make changes. At the end of this weeks batch, I will also construct a sideboard and incorporate cards from Future Sight. Now, on to the matches. First I'm up against GravespawnGoddess' admittedly new deck. I keep a decent opener and we are off. He looks like he is playing RB aggro, judging from the turn two Wretched Anurid. Turn three I am met with an interesting decision on whether to Feast a new Karplusan Wolverine or go for an Imp into Gorger. I opt for the Imp play, as it means for damage to his dome. He lets the Gorgers through and then burns it with an Incinerate. He then torches the Imp for one. I feast the Wolverine and pass. Stuck on four lands with no outlet, I start forcing Gorgers out hardcast to draw out his burn and hopefully gnaw at his life total. Gravespawn lets the Gorgers survive and the Zombies halt the attack. On my turn, I swing with the Gorgers and play the other one out of my hand. He then Terminates the new Gorgers on his first main phase and swings for three and torches me for four before Fireblasting me out. Game two starts out with a turn one Imp which is met by Firebolt. A turn two Keldon Marauders from him tells me he is playing what I would call a bad version of 2Drop. I do not think it will matter much since this deck currently can not deal with a solely aggressive strategy. I manage to stabilize after Harvesting an Imp to Wither a Wolverine, but proceed to topdeck numerous lands. He goes aggressive with the burn plan, aiming everything at my face. I however counter his Torch for six, which stops him for now. I then go on the aggressive with Gorgers. It does not matter, as he Torches and Fireblasts me out... again. There was nothing I could have done differnetly, except perhaps mulligan in these games. He was playing a deck overloaded with removal and burn and I never drew my foils in time. Something to keep in mind for my first sideboard. Second is coolbartbr, the notorious net decker. His first play is (Birchlore Ranger), telling me he has copied Kingritz's Pointy Elves deck, designed to abuse hard to block creatures and Timberwatch Elf. I top deck a feast and take out the minor engine. He then lays a better engine in Quirion Ranger and I respond with a misclick, dropping a Keeper instead of a Looter- I guess playing after doing poorly in release leagues is never a good thing. He then plays out a Spikeshot Goblin- like all Kingrtiz decks, this one has a tenuous and fragile win condition. However, like Kingritz decks, if the win condition sticks around, it is tough to beat. He follows this up with Wellwisher. I get stalled on lands and really can not overcome his creature advantage. Sigh. Not really wanting to play go through the motions, I concede this one. Game two I mulligan to five. He plays and cracks an Expanse. This is almost always wrong. You should almost always wait until your opponents end step to crack an Expanse except in circumstances when having that land in play actually helps your cause. I bait his Wirewood Herald with a Gorgers because I am holding a Withering. He obviously fetches Timberwatch. I stick a Syphon-Mage and slowly eat at his life total, but he lays another Timberwatch. He then lays double Quirion Ranger and Seeker of Skybreak, telling me this deck needs either Psychotic Haze or Wail of the Nim. It is soon over, and I am winless this week. As much as it hurts me to do this considering my losing ways, I must carry on with the experiment, resolving myself to play three more matches. Match three is against the mind behind the cards to this deck, idoru. He is playing his signature BG Dredge deck. He counters an early Gorgers by sacrificing a mana Elf. His Last Rites does not really hit anything important and I start whittling away his life total with Looters. Late in the game he flips a Gathan Raiders into a 5/5, but it is far too late for him to recover and he dies on my next attack. Game two he gets an early Wild Mongrel which is always bad news for me. He follows it up with a Golgari Brownscale and I know I will be hard pressed to win against his near perfect draw against this deck. I Winds into a Fat Rat, which suddenly makes this game look much more winnable. I then stick a Syphon-Mage, which is more good news for me. A misplay lets him resolve a Crippling Fatigue through a Rune Snag (I thought I had an extra one in the bin), weakening my overall position. And then my internet dies. Wonderful. So I guess I will have to call that one even. This week does not look like it will turn out in my favor. Match four is against Rich playing his Chilly Dog deck- Deep Dog with Armadillo Cloak back up. Game one I get a slow but potentially dangerous draw. I counter an early Mongrel and start beating with Looter. He floods and I go aggro with triple Looter (!!!). The Looters go to town filtering with the help of two Fat Rats, and Rich can not do much to stop me. Game two I get a nice, yet reactive, draw. I keep because I know one of the best ways to beat him is to disrupt his tempo. We trade lands for a number of turns and he acts first with a Looter. I respond with an Imp. His triple Burst draw is too much though, and I lose in short order to Looter and friends mostly because his fatties can block and mine are unable to. Game three I Feast his early Looter, which is key and then have my Winds for three countered. No real loss there. I see an opening late in the game after he stumbles on mana and stick a Rat. I do some tricks with Gorgers to get rid of his big Bear and then stick another Rat. It is over soon after. My last match in this batch is against ioginy. He matches my Imp with Sage of Epityr, telling me he is running either Storm or Ninjas. He blocks the Imp and I lay another one. He does nothing but lay Islands, so perhaps he is some MUC variant. He simply amasses lands while I beat down slowly. He gets to six lands, but still no action aside from an Exclude on my Pit Keeper. After he drops to 14, he plays Piracy Charm on my Imp. I am guessing his game plan is to wear away all my resources and then lay down Spire Golem beats. He attempts to hard cast a Ninja of the Deep Hours which I Rune Snag while he has the mana to pay for it, but he lets the counter resolve. He then lays another Sage and I Think Twice twice into two useless Winds. By now he has amassed a large amount of counters, meaning I have to bait them out slowly. I hate playing against MUC. I go for Winds at the wrong time and concede. I was far to slow that game to get anything going. Game two his maindeck Charm nabs my turn two looter. Fun. And then I stall on land. Even better! I know I have no shot when he turn fours a Golem. Sigh, I guess that is why I test. I stall on three lands and just scoop. So what have I found? I know I am good against aggro-control as shown by the Dredge and Chilly Dog match-ups. However, I am a dog to both all out aggro and control- powerful forces in PDC. However, since I have started this project, MTGO has been given Future Sight, which gives this deck many great options. Starting off, however, I need to make this deck more aggressive. Hopefully this will help against control. 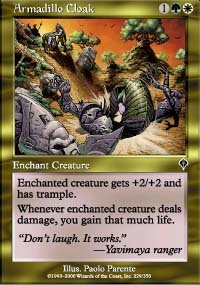 Aggro, right now, is a problem to be relegated to the sideboard, where I have ideas for some interesting tech. But first, examining the core cards. Tolarian Winds is just underperforming at every step of the way. I wanted this card to work, but I just has not been able to. I am going to drop down to two, but I do not forsee this card being in the final deck. 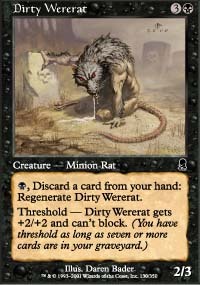 Dirty Wererat, on the other hand, has been great when it hits the board. However I find myself drawing him far too early in many games. This leads me to believe that three is the correct number for the Fat Rat. Looking at other cards, the Syphon-Mages have been great in certain matches, and dead weight in others. This tells me that they are best suited as sideboard material, which is where they will find a home. I love Pit Keeper, but there is an interesting card in Future Sight- Grave Scrabbler, that does something very similar and is much more synergistic. Because of this, I will be cutting two Keepers for two Scrabblers. Feast of Flesh, while nice, does not do a good job of removing creature. I cut all four for a third Dark Withering and three (Ichor Slicks). With the remaining slots, I add four Gathan Raiders, hoping to smooth out my draws, provide extra outlets, and generally do some damage. This leaves one slot. As a proposed “aggro” deck, the deck should adhere to my notions of Power, Synergy, and Curve in some way. I was lucky enough to have a brief conversation with Dan Paskins about the Trinity of Aggro. He felt that rather than having to bend to a particular aspect of the Trinity, the championof little Red men told me that aggro decks should exhibit some qualities from each of the three tenets. Looking at this deck, it might be true. There is obvious Synergy here, which in turn can produce quite a bit of power. Curve, on the other hand, is a weak spot of the deck. The deck is overloaded at the two drop and has few natural cards in the two slot; this could prove problematic. There is only one way to find out though- more testing! The brief testing I conducted with this build shows that it does have promise, handling both aggro-control and the highly reactive decks rather well. However, it still has issues with the ultra-aggressive decks, which is something the deck needs to be able to handle. This batch has also led me to question Think Twice and Tolarian Winds, since I would rather have more threats- whenever I draw one of these, I wish it was a threat instead of a way to find a threat. I might cut these four for two Foresee and two other threats or answers, if the testing shows that is a sound plan. I usually pop my expanses at the end of my opponent turn, but seeing as this was a casual game, and I was also chatting I was worried I would forget to pop my expanse. As for the netdecking I usually do tweak most decks I play, but in order to do that I have to get a few games in. Also, I'm pretty sure that for the same reasons you can't mention mtgo names on the boards you can't mention mine in your articles. "Second is coolbartbr, the notorious net decker"
What the heck is that supposed to mean. I've heard all sorts of cries about how netdecking is the death of the community, but to be frank, there are deckbuilders, and deck pilots, and combinations of the two. Netdecking shouldn't be associated with a word that implies a negative meaning, but rather just accepted as a truth and use the knowledge to look up the list and best the opponent. I totally understand your point. I suppose that I overreacted here, but I feel I can better explain my point now. You are correct about deck builders and deck pilots. However, the most successful pilots in PDC (nickpzo and LostButSeeking in my opinion) always brought their own tech to the deck, or their own play style- and they were good pilots. Certain players, again in my opinion, simply pick the easiest to play deck and pilot it, not understanding how to properly run it. Netdecking in it of itself is not bad- it is netdecking without learning how to play the deck that is the sin. The real sin is losing to the horrible netdeckers who don't even pop their terramorphic expanses correctly. 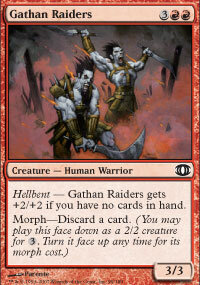 Gathan Raiders is very, very good. I was a little disappointed I didn't get to play vs. this last night.